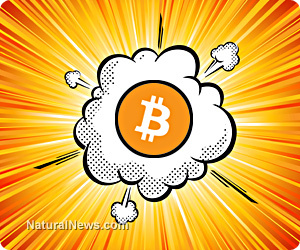 (NaturalNews) There's a bigger agenda happening with bitcoin that needs to be publicly stated, and this goes far beyond the issue of the financial harm that will be caused when the bitcoin bubble finally implodes. Central banks hate bitcoin. They hate it because it doesn't allow them to loot bank accounts (Cyprus) and control the movement of capital around the globe. Bitcoin, in fact, threatens the very foundation of monetary control that underlies all the corrupt governments of the world. As such, bitcoin is a huge threat to the status quo, making it an obvious target for the globalists to attempt to destroy. Discrediting bitcoin isn't enough, however. To really be effective, they need to make bitcoin illegal. Mission accomplished! You've now made bitcoin look like a "pyramid scheme," you've scared the public into being wary of "anti-government currencies," and you've criminalized their use by consumers. That's the goal the central banks are trying to achieve right now. It's all be set in motion by the bitcoin bubble which will inevitably lead to a bitcoin crash. The bitcoin bubble is to currency freedom as the Sandy Hook shooting was to firearms freedom. In both cases, governments will use a crisis to destroy freedom while claiming to be "saving" the people. For the record, I'm a proponent of bitcoin and I want it to succeed in the long run, but the mania speculation happening with bitcoin right now is going to be disastrous for its reputation. It is the worst thing that could happen to bitcoin. What we would prefer to see is a slow, steady rise that reflects stability with low volatility. Instead, we see extremely high volatility, wild price ranges, desperate purchasing patterns and even purchase queues at some exchanges where the demand for bitcoins is so high that it exceeds the limits of the services (such as Coinbase, where you now have to stand in line to buy bitcoins two days later at whatever "market" prices are offered that day). Mark my words: A bitcoin crash will occur, and a lot of people are going to be financially hurt by it. More and more, this bitcoin craze is looking like a "pump and dump" operation, where the only winners are those who are the first to sell. By the way, the simple way to prove to yourself that everything I'm saying here is true is to ask yourself this simple question: What do the people who are buying bitcoins plan to spend them on? The answer is NOTHING! They don't plan to spend bitcoins on anything. They have no use for bitcoins. Their only play (for 90+% of those buying them) is to buy low and sell high. That's it! For them, bitcoin is nothing more than a speculative vehicle for gambling with some of their money. But the velocity of bitcoins after the initial purchase is shockingly low. What this indicates is that people are buying lots of bitcoins but then sitting on them. Once bitcoins are purchased, in other words, they basically just sit around and aren't used for any practical purpose. Amazon.com, for example, doesn't accept bitcoins. You can't buy gas for your truck with bitcoins. You can't shop with bitcoins at the local grocery store. Until bitcoins are more widely accepted and the velocity rises, there is no fundamental reason why their value should suddenly skyrocket. Of course, those who are deep into bitcoins right now will call me a doom and gloomer. Sure, it's okay for them to talk about how the dollar is going to crash, or how the Fed is a criminal operation, but the minute I start invoking mathematical reality with bitcoins, suddenly I become the bad guy. As always, there will be people (we call them "noobs" or "suckers") who think they have stumbled upon the one exception in the universe to the laws of mathematics and that bitcoin somehow represents a galactic shortcut to universal wealth where everyone can become billionaires by trading each other electronic chunks of data with higher and higher numbers encoded in them. These people are fools, and history will prove them so. After the bitcoin crash takes place, people will ask me, "Mike, how did you know bitcoin was going to crash when everybody else thought it was going to keep going up forever?" And my answer will be, "Because I believe that 2 + 2 = 4." If you understand mathematics, you know that the bitcoin bubble is doomed. Sell while you still can and be happy with the profits you've made so far. Importantly, remember that the only reason you can sell is because there's a "greater fool" on the other side of that transaction who is buying your bitcoins. Frustratingly, perhaps 95% of the people who will comment on this article in social media websites have no understanding of high-level mathematics, no understanding of economics, no understanding of free markets, no understanding of greed vs. fear psychology and no historical context through which they might understand what's happening with bitcoin. Almost no one buying bitcoins has any clue what they are. They don't even understand the meaning of the phrase "decentralized peer-to-peer crypto currency" and they have absolutely no working knowledge of public / private key cryptography. They have no idea what they are buying and they have no qualifications whatsoever to even discuss the topic. This is a case where 95% of the people talking about bitcoin need to be told, simply, "Shut the hell up!" because they literally have no clue what they are talking about. If you are going to talk about bitcoin, make sure you understand the fundamentals of mathematics, cryptography, free markets, economics and human psychology before opening your mouth. Otherwise, you are only announcing to the world that you're a complete fool who will soon be parted from his money. And to all those who think they are going to "get rich" by buying bitcoin today and selling it off when bitcoin goes higher, let me offer you a piece of practical advice: After the bitcoin crash, when you are screaming bloody murder and selling your bitcoins at perhaps 1% of what you paid for them, it will be people like me who will buy them and thus receive a 99% discount on the bitcoins you once bought at a hundred times the price. That discount is called the "IQ discount." You know how lotteries are called a "tax on people who can't do math?" The bitcoin crash will be a massive global wealth transfer from people who can't understand the dynamics of decentralized crypto-currencies to those who do understand. If you don't follow what I'm saying here, then don't buy bitcoins. You will only be led to the mathematical slaughter.